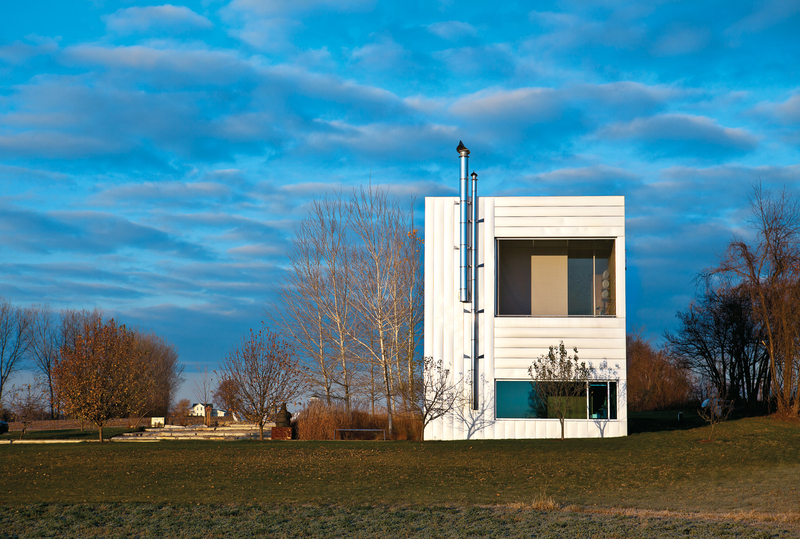 The exterior of the Field House, designed by Wendell Burnette Architects in Ellington, Wisconsin. A longtime collector of furniture and art, Dr. Robert Geller finally lives among his prized possessions. In the living room, he sits on a Barcelona chair by Mies van der Rohe for Knoll. To his right are an Arco floor lamp by Achille and Pier Giacomo Castiglioni for Flos and a BeoLab 5 speaker from Bang & Olufsen. The sculptures to Geller’s left and in the foreground are by American artist Arlene Shechet, Everything Seems to be Something Else and Just Remembered. The master bedroom; the painting is by Radcliffe Bailey. A silo ladder in the study leads to the roof deck. Both desk lamps are Tizios by Richard Sapper for Artemide; the pendant is a Zettle’z by Ingo Maurer; and the Kalos armchair and Solo desk chair are by Antonio Citterio for B&B Italia. The deck in the "memory orchard" of the Field House. The winter winds blow heavy from the northwest in Ellington, Wisconsin, icy echoes of the great glacial retreat that formed the local topography. The dense woods of the early 19th century have given way to farms, large rolling plots where alfalfa and soy, silos and barns spring from the rich alluvial soil. Those local farm buildings—“stoic structures of utility and purpose,” architect Wendell Burnette calls them—may have humble forms, but they serve more purpose than storing grain. Oriented with their broad backs to that punishing wind, they tuck homes and porches into their protective shadows. At first glance, the Field House, a long rectangular box clad in shiny Galvalume Plus, and which Burnette designed in 2005 for Dr. Robert Geller, seems to owe its biggest debt to the region’s agricultural aesthetics. 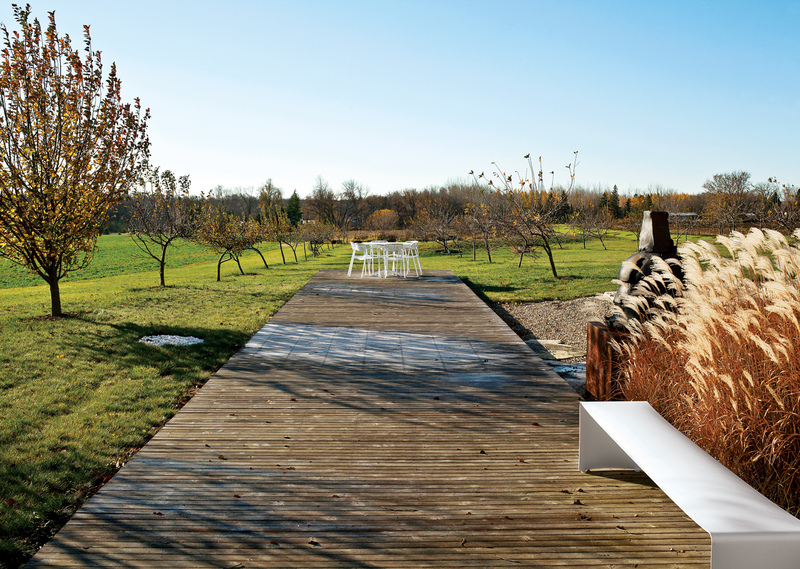 But look closer at how the house is positioned—flanked to the northwest by a line of trees, its leeward face looking out toward a meadow, a bird sanctuary, and a new fruit orchard. Like the hardworking buildings that have come before, the Field House is a product of Wisconsin know-how, a structure as native as the badgers and wood violets. “I need to live in an area that has four seasons, and I need to really feel them change,” says Geller. “It’s part of my biological rhythm.” That yen to move with nature may be how the oncologist is wired, but Burnette took Geller’s words less as a wish than as a cri de coeur. “Robby gave me a very brief aspirational program for this house entitled ‘Land, Sky, and Seasons.’ He listed some of the requirements for the house from the standpoint of rooms but, more important, the kind of spirit he wanted us to focus on,” says Burnette. Burnette’s mission was not merely to drop a modern home for the doctor and art collector onto the 18-acre lot that was once part of a family farm. Instead, his goal was to stitch a climatically and culturally sensitive house—with a fire pit, screened porch, three-car garage, and a generous roof deck—directly to the landscape. Geller met Burnette in Phoenix (where the architect is based) while on a job there. No stranger to construction, Geller had two previous homes built, one a renovation in Atlanta and the other a contemporary ground-up design in Kansas City, Missouri, that fell prey to restive neighbors. Geller had long admired Burnette’s architectural approach, an affinity that grew stronger after the sour experience of having left his home in Kansas City without ever having lived in it. When Geller, an Ohio native happy to return to the region, took a job in Wisconsin, he wanted complete freedom to build and Burnette’s help. “I called up Wendell,” Geller recalls, “and said, ‘Hey, how do you feel about building a house in Wisconsin? We can do whatever we want as long as we build 25 feet off the property line, which should be no problem, because it’s an 18-acre rectangle.’” Beyond experiencing the shifting seasons and a free hand with which to design and build his long-sought dream home, Geller had something else he wanted to observe: the night sky. With a master’s degree in astrophysics from MIT, the amateur astronomer now trains his 14-inch Meade Schmidt-Cassegrain telescope on Wisconsin’s end of the heavens from a specially designed platform on his roof. “The telescope sits there on a column,” says Burnette, “with a cove and an area to walk around it. So you climb up a silo ladder from the study and pop a roof hatch, and then there’s a little walk on the roof that’s between the guardrails that takes you to the observatory.” At the other end of the roof deck is an Orgone chaise longue by Marc Newson for Cappellini, a spot where Burnette and Geller have shared many a cigar and tequila, below-zero temperatures be damned.